Back home around midnight after a long weekend in New York City, I didn’t eat any dinner and was famished by lunch. My friend/boss/fellow foodie Eric popped by the office to let me know he was going out for a barbeque sandwich at Jimee’s. Which I had never heard of, so of course I have to go along to try it out. 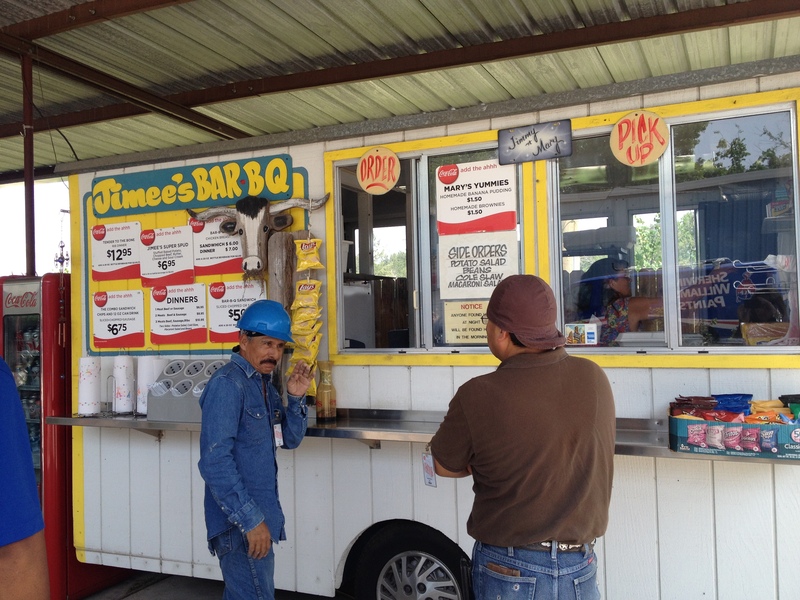 Jimee’s is a barbeque truck located spitting distance from Bush Intercontinental Airport, located on a side road. One side of the road is lined with pines, which hide the boundaries of the airport property. The truck is nestled between a RV storage business and more uncleared pine forest. Eric reported that at 5 p.m., the tiny parking lot is full of cars (always a good sign). A few old picnic tables are located under a large awning, so lunchtime eating is an option if it’s not high summer. This is pretty much ALL the fixin’s. 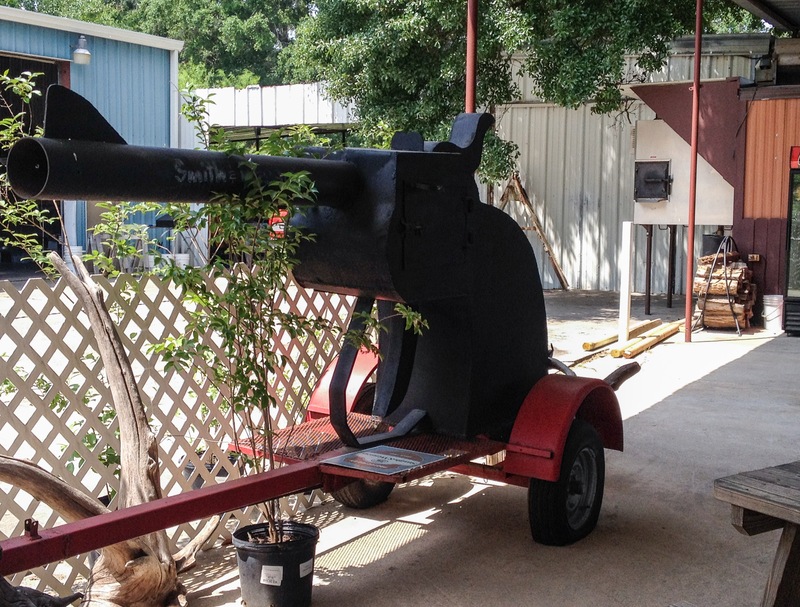 The true test of Texas barbeque is the brisket, and wow, was it great. I’ve bragged on Luling’s City Market many times here, and while I love the flavor and heavy smoke ring at Luling’s, old Jimee had not only flavor, but a great moisture that wasn’t based on too much fat. The sauce was thin, vinegar-based, and perfectly complimented the meat. 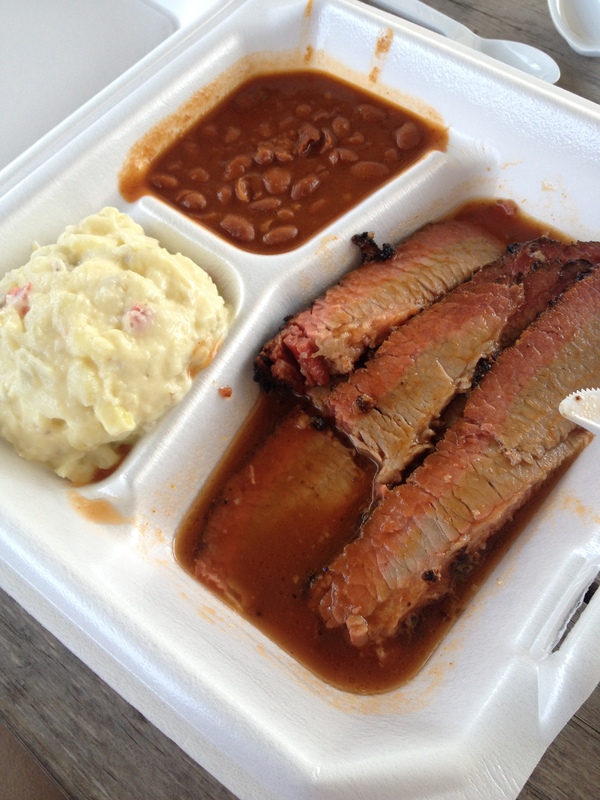 I’m a purist – if you have to dollop heavy or sweet sauce on your brisket, start over on the brisket. Jimee’s uses a gas oven rather than wood smoke, so you don’t get the same flavor, but it’s a good lunch. Nothing fancy to look at, but very good! A small side of potato salad, and standard Ranch-Style Beans rounded out the meal, although you could also get coleslaw or mac ‘n cheese. The guy at the adjacent table was smacking down on a rib, and they looked wonderful, as well. Sometimes, I will have a new way to head home after work! 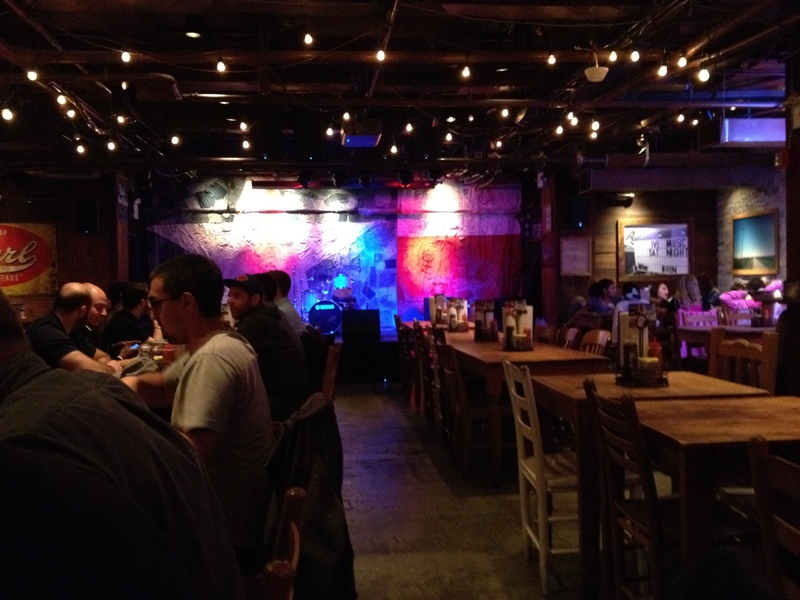 Below is a picture I took of the place I had dinner last Saturday night, in Manhattan near Rockefeller Center. I’d give it an 8 on quality. Everything tasted good, although more black pepper than I’m used to (not complaining). The brisket was on the dry side, but the corn pudding was good, and they had Blue Bell ice cream! Sticker shock, though: One rib, two slices of beef, one hot link, one beer – $31 plus tip! By contract, we got two plates of food from Jimee’s, with iced tea, for $15. On the plus side, I was dining with old friends and new, who were actually from NYC. I assured them that it was pretty authentic. Except for the price. 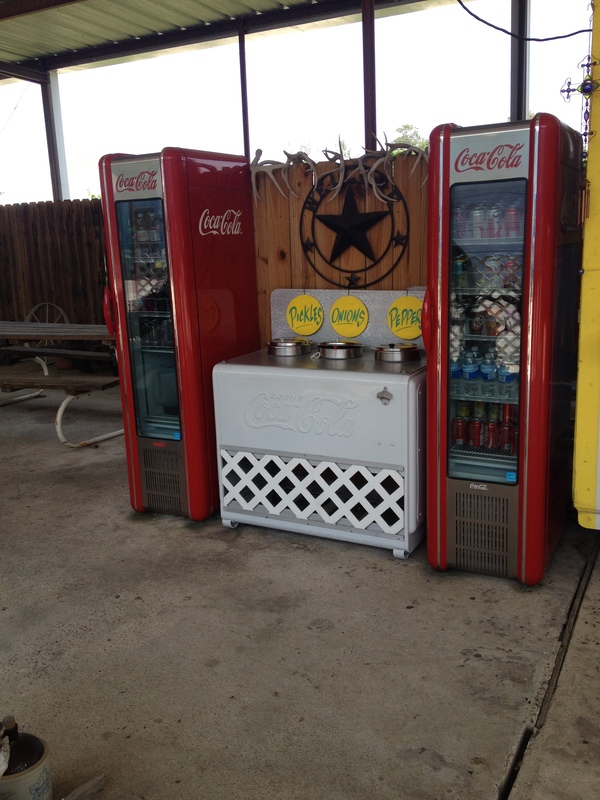 Jimee’s Barbeque, 17919 Aldine Westfield Rd, Houston, TX 77073. Super nice couple running the place!